JOHANNESBURG -- Britain's Prince William is in Africa this week to discuss threats to conservation ahead of a London conference on the illegal wildlife trade. The Duke of Cambridge was in Namibia on Tuesday and will visit Tanzania and Kenya. On Monday he met Namibian Vice-President Nangolo Mbumba. The prince's weeklong trip ends Sunday. Kensington Palace says Prince William is making the "private working trip" as president of the United for Wildlife group and patron of Tusk, another conservation organization. 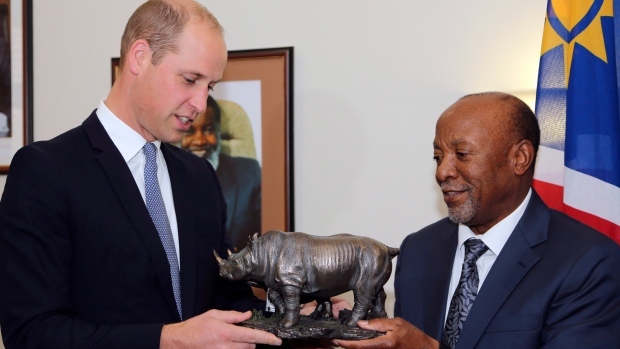 The prince has campaigned against the killing of elephants, rhinos, pangolins and other species. He has also noted that poaching has a human toll when rangers are killed, communities lose the benefits of wildlife tourism and criminal networks flourish. Britain hosts a meeting on the illegal wildlife trade on Oct. 11-12.